Iran's clandestine spy network has been threatening and blackmailing scores of journalists, even going so far as to detain and threaten the family members of these reporters, in order to ensure positive coverage in global media outlets, according to a new report that estimates at least 50 international journalists have been threatened in just the past year. Outlets such as the BBC and Voice of America have been subjected to threats and in some cases have had their computers hijacked by Iran, according to the report, which states that "all international media outlets with Persian-language services are concerned" about the Islamic Republic's often-secret efforts to blackmail reporters in order to gain positive headlines. The effort is just one part of how Iran blackmails, threatens, and manipulates journalists and dissident voices in order to suppress coverage of its human rights abuses and other illicit activities, such as an ongoing massive military buildup aimed at confronting Western nations such as the United States. "In the past year, RSF has learned of ten families of journalists who have been summoned to such interviews, usually with intelligence ministry agents," according to the report. "In all, at least 50 journalists based abroad have been threatened in some way in the same period. At least 16 of them have received death threats." During international nuclear negotiations in Vienna, Lausanne, and elsewhere, the Washington Free Beacon independently witnessed Iranian reporters allied with the country's state-controlled media organizations monitoring reporters and snapping pictures of them as they worked. This is part of Iran's efforts to monitor and track reporters who cover the country for a range of influential outlets, sources told the Free Beacon. "It was insane," one writer who is critical of Iran and attended the nuclear negotiations in Vienna told the Free Beacon. "They would openly get in the faces of Iranian reporters from Western outlets and take pictures just to make sure that the journalists knew that the regime knew who they were and they were being watched. It's impossible to imagine this didn't significantly influences the coverage that came out of the nuclear talks, and even more broadly." Sources who spoke to RSF, often anonymously to avoid repercussions from Iran, such as imprisonment, told the organization that the country's intelligence services have issued threats and in some cases detained the family members of these reporters. "It is not just BBC Persian employees who are targeted," the report states. "All international media outlets with Persian-language services are concerned, regardless of the country in which the media are based. Journalists with Radio Farda (Radio Free Europe's Persian-language section), with such state-funded broadcasters as Voice of America, Deutsche Welle and Radio France Internationale, and privately-owned broadcasters such as Manoto TV and Radio Zamaneh have also been threatened by Iran's intelligence services or judicial system." 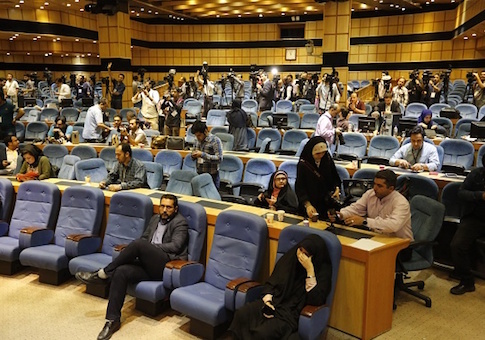 Most of those who spoke to RSF about Iran's activities to monitor and threaten the press "asked not to be identified" out of fear of reprisals from the regime. However, some did speak on record. Arman Mostofi, the director of Radio Farda, was quoted as telling the organization that at least four of his reports have been targeted with death threats. "These threats are obviously not signed," Mostofi told RSF. "They sometimes take the form of a comment beneath an article. The journalist may subsequently be contacted in another way but it's exactly the same message that will be transmitted. Sometimes the message includes information that only members of the intelligence services could know." Family members also have become the subject of threats, according to the report. Fahimeh Khezr Heidari, a Radio Farda host, recounted efforts by anonymous individuals to force the broadcast's cancellation. "Ms. Khezr Heidari, Monday will be a horrible day for a member of your family because you did not take our last warning seriously. Thank you, my corrupt sister," read one message sent at the reporter. Mohammadreza Nikfar, editor-in-chief of Radio Zamaneh, disclosed that the family members of some reporters have been seized by Iranian intelligence agents. "The family of one of our journalists was summoned by intelligence ministry agents," Nikfar recounted. "After showing articles by him that had been posted on our website, they said: ‘Tell him to stop collaborating with Radio Zamaneh.'" "Another journalist, a former prisoner of conscience, has been threatened several times by telephone. They tell him his family will suffer the consequences if he does not return to Iran," Nikfar said. The threats and intimidation tactics also extend to the cyber arena, according to others who experienced attempts by individuals to hack their computers. At least five journalists have been arrested upon landing in Iran and handed harsh sentence's ranging from three to 12 years in prison, according to the RSF report. The tactics have a tangible effect on these reporters and the stories they file, RSF concluded. "When your father calls and an intelligence ministry agent takes the phone and says, ‘your father is here and we're talking about you,' and you know that your family is being harassed and is in danger of being arrested, how can your write freely?" one reporter for an international outlet who declined to be named was quoted as telling RSF. "After members of my family had been summoned for questioning, I could no longer work as I had before." RSF, in a statement, formally condemned efforts "by the Iranian judicial system and intelligence services to influence the Persian-language sections of international media outlets by putting pressure on Iranian journalists based abroad and on their families still in Iran." In addition to the threats and blackmailing, the Iranian regime has used financial tactics to crackdown on Western media outlets. Iran recently froze the assets of more than 150 BBC reporters, effectively barring them from conducting financial transactions in the country, according to RSF. "Nowadays, the families of foreign-based journalists are ‘politely' summoned to interviews with intelligence officials but the message is still the same: the journalists must ‘stop collaborating with enemy media' without delay," according to RSF.